By Ross Elliott - posted Friday, 13 June 2014 Sign Up for free e-mail updates! In housing we are eating our young. 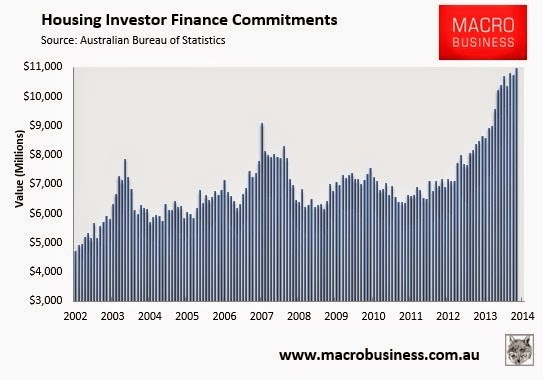 Investors are competing aggressively with first home buyers for available product, and winning. In what may be the shortest post of The Pulse's history, there are just two graphs that seem to suggest this might be true. If it is, what next? My thanks to Leith Van Onselen and his colleagues at Macrobusiness for this one, but it struck such a discord that I thought it worth highlighting. 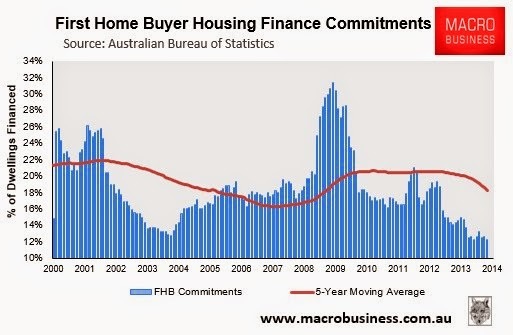 The Australian Bureau of Statistics figures on housing finance are a measure of activity in housing markets. Something the Reserve Bank watches closely. Their latest sets of data paint a concerning picture. If this stark contrast doesn't suggest something is amiss, nothing will. Draw your own conclusions. If you're a developer, a deal is a deal and it doesn't much matter who is buying the stock, provided it makes the project feasible, pays the wages and the consultant's bills, pays the taxes and hopefully leaves a healthy profit. If you're in public policy though, you would like to think the ramifications of this distorted playing field might be sinking in. I'm not sure that it is. The Federal Government says housing is a matter for the States (notwithstanding the Reserve Bank's clear and publicly admitted interest in housing market dynamics). The States tend to pass a lot of responsibility – in terms of levies and charges and compliance costs associated with the supply of new stock – to Local Government. And Local Governments tend to blame both the States and the Feds for a lack of resources for infrastructure associated with housing supply and growth generally. Those who point to the obvious problems in public policy settings are faced with the three monkeys rule: first denial, then pass the buck, and if that doesn't work, shoot the messenger. We have a very fundamental problem with distortion in our housing markets that is already spilling over into other aspects of economic policy and questions of generational equity. If these two graphs don't make that obvious, nothing will.